Daniel Murphy sets postseason homer record as Mets advance to World Series. Daniel Murphy’s record-breaking home run. It is very confusing. New York Mets second baseman Daniel Murphy is having one of the greatest postseasons in the history of this or any planet, and now he’s going to the World Series. Murphy, who is a free agent at the end of this season, had already hit two singles and a double in game 4 of the National League Championship Series against the Chicago Cubs when he hit an eighth inning shot to straight away center field for his seventh home run of the postseason. The game was already virtually out of reach at that point, but it helped seal the victory and the 4-0 series sweep to send the Mets to their first World Series since 2000. With that, Murphy also broke the record for consecutive postseason games with a home run, having hit homers in six straight playoff games. Carlos Beltran previously held the record with five straight postseason games with a home run for the Houston Astros in 2004. Murphy is two games away from tying the all-time record for consecutive games with a home run, postseason or regular season. While it would be hard to imagine him closing on that mark, no one would have predicted what he’s done so far in this postseason, so who knows? He has hit seven total home runs in 38 at bats this postseason and is now one away from tying the all-time record for total home runs in a single postseason. Astonishingly, the 30-year-old Murphy had averaged about 9 home runs in 479 at bats per entire season over his first seven years with the Mets, which begs the question: Has Murphy been secretly replaced by some creature from beyond the moons? 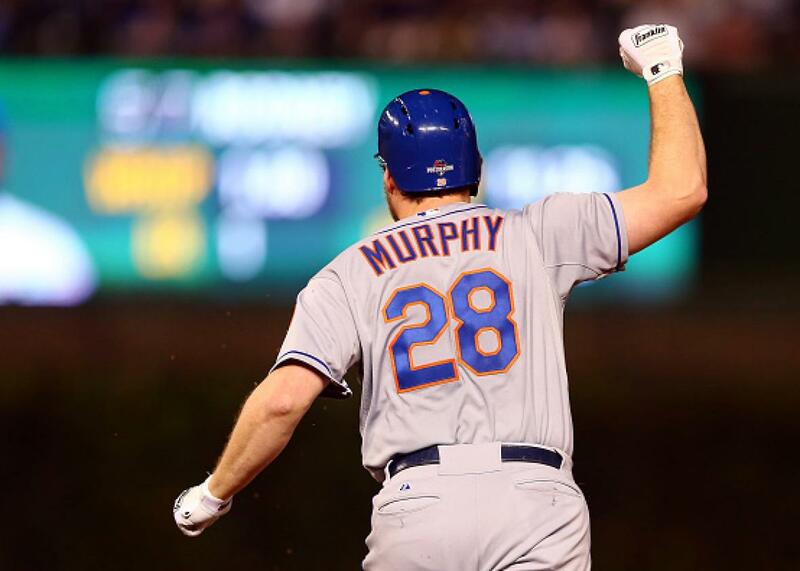 After the Mets closed out the win at Wrigley Field to clinch the National League pennant, Murphy will now have the opening game of the World Series to try to keep his streak alive. He will have his chance to do it in either Toronto or Kansas City.